Vredo has been at the forefront of precision overseeding for over 30-years and concentrated on the functionality and aesthetics of the machines in order to provide customers with more precise and sleeker models. Every aspect of the range has been analysed and reimagined to improve the user experience and end results. The lid and rear of the seed hopper have been given round shapes, making it easier for the seed to find its way towards the cam wheel and the platform has been made easier to reach. The Agri Air and Twin series calibration trays are now mounted on the inside of the lid, so the tray cannot be lost in action while always being stored in a dry place. The platform on the Agri Twin is now bigger, mounted higher and equipped with a foldable step for easy access. This makes it easier and safer to load the hopper with heavy seed bags during smaller operations. Enhancements to the machines are completed with the additions of LED lights and striping to give the machine a sturdy appearance. 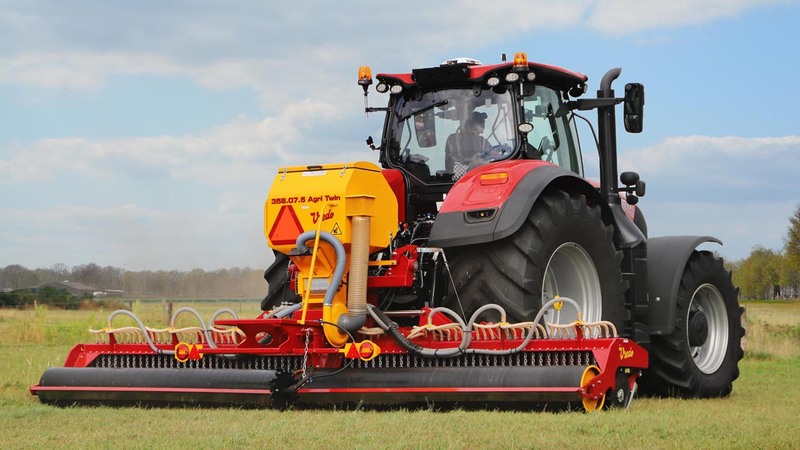 Representatives from Vredo will be on the stand to answer any questions about the overseeders. The Imants spader series will also be represented on the stand. This series of machines has been constructed to provide maximum performance with minimum fuel consumption and mechanical stress. Imants spaders leave no plough pan, give better incorporation of organic material and leave a perfect seedbed and soil structure in one pass.